Human Trafficking is becoming increasingly recognised as a global public health epidemic with an estimated 45.8 million individuals affected by some type of exploitation. The effects of trauma and exploitation have profound health implications and often leave victims isolated from society. Victims of Human Trafficking are commonly associated with vulnerability, comorbidities, poor access to, and engagement with, healthcare services. Given this situation, an exploration of trafficking and access to healthcare was indicated. A focus group explored the experiences of six third sector workers in supporting victims of Human Trafficking. Thematic analysis was used and four overarching themes emanated: a call for improved access to treatment for victims affected by mental illness; improved knowledge and training of health professionals in identifying victims; the challenges for victims navigating two complex systems (National Referral Mechanism/Asylum Process) and victim’s self-identification. The findings highlighted the associated complexities that victims commonly face when accessing healthcare and emphasised the fundamental need for ensuring that equitable services are available. To enable safeguarding and individualised care to become embedded, a shift in culture and a move away from judging healthcare need on immigration status was recognised as a key requirement. Improved access to psychological therapy for victims was also suggested, alongside better education for all health professionals and frontline staff. To improve healthcare for victims of Human Trafficking in the ways recommended would require Government and National Health Service (NHS) support including increased financial and staff resources. Human Trafficking, also known as modern day slavery is distinctively different to people smuggling and recognised as a global public health epidemic, carrying with it significant debilitating effects for exploited individuals [1,2]. It reflects a profound violation of human rights, with frequent bouts of violence, the stripping of identities and the denial of freedom of movement . Human Trafficking and the notion of slavery is often presumed as a problem of the past, although such views are not reflective of the current situation (UN Office for Drugs & Crime . In 2016, the Gallup surveys estimated that 45.8 million people across 167 countries, were forced into some type of exploitation, although, Human Trafficking is often a hidden crime and as such statistics should be interpreted with caution . In the UK, the implementation of the National Referral Mechanism (NRM) has helped identify and quantify the prevalence of Human Trafficking . However, this data only captures victims who are referred into the NRM and individuals who decline referral remain significantly underrepresented . In 2016, 3805 potential victims were identified through the NRM; a 17% increase in comparison to 2015 . The uncertainty of the true prevalence of Human Trafficking, remains a significant challenge in the identification and care of victims . The NRM’s mandate is to support the identification of victims and ensure appropriate management and subsistence is provided . First responders such as the police, social services and authorised third sector agencies are trained to undertake the initial NRM assessments. These are then passed to the competent authorities for a decision to be made on whether there are reasonable grounds to believe the individual is a victim of Human Trafficking. The asylum process is separate and independent from the NRM, although, the conflation of the NRM/Asylum and frequent 'abuse of processes' has been previously noted (Anti-Trafficking Monitoring Group; unsurprising given that the Home Office is one of the competent authorities [8-10]. The acknowledged that the NRM is not currently fit for purpose and at its worst, flagrantly disregards professionals’ views. ‘The recruitment, transportation, transfer, harbouring or receipt of persons, by means of the threat or use of force or other means of coercion, of abduction, of fraud, of deception, of the abuse of power or of a position of vulnerability or of the giving or receiving of payments or benefits to achieve the consent of a person having control over another person, for the purpose of exploitation’. The notion of vulnerability is closely associated with trafficked victims. The UNODC (2008) identified that it is common for traffickers to prey on individuals who find themselves disempowered, vulnerable, impoverished, disabled and socially excluded [12,13]. Furthermore, Human Trafficking, with substandard living conditions and barriers to healthcare result in poorer health including increased rates of mortality and morbidity . The National Institute for Health and Clinical Excellence identified the importance of ensuring that seldomheard groups have seamless access to healthcare services . It is acknowledged that factors including homelessness, asylum seeking, language barriers and a lack of individual knowledge regarding the benefits of accessing healthcare can all act as barriers. However, it is recognised that if clear provisions are tailored towards the characteristics of the most commonly identified vulnerable groups then barriers will be significantly reduced [15-18]. The effectiveness of delivering psychological therapy to victims, remains poorly evaluated, systematic review by Hemmings et al. identified that victims of Human Trafficking frequently suffer post-traumatic stress disorder (PTSD) and complex medical, physical, psychological healthcare needs. Furthermore, recognised that Mental Health professionals are in a pivotal position to support victims of Human Trafficking and acknowledged a professional duty to ensure victims are referred to the necessary care and treatment . Westwood et al. identified that despite profound physical and psychological health comorbidities associated with Human Trafficking, there remained a lack of knowledge around victim’s personal experience in accessing healthcare. The crosssectional survey of 136 victims explored the utilisation of health care services during and post exploitation. The survey identified several barriers, including traffickers interpreting for victims and victims being denied access to healthcare services without official papers. Recommendations included, an emphasis on the need for better guidance and training to improve health professionals’ awareness, but also acknowledged the need to reach out to frontline staff. Therefore, supporting equitable healthcare regardless of residency status. Advocacy support to enable access was also considered as a critical component to breaking down barriers. The need for better awareness and specialist educational training packages for health professionals [21-24]. In addition, supported the implementation of designated referral pathways and protocols aimed at providing a better overall service for victims. Some studies have explored health professionals’ views around barriers associated to accessing healthcare, although, this has primarily focused on a generalised concept, such as ethnicity, asylum seekers and refugees . The literature looking at the connections to Human Trafficking and health is sparse or dated, particularly from a third sector’s perspective . Since BAWSO’s  report, new community and Government initiatives have been implemented in Wales to tackle some of the gaps within service provision. Further exploratory work was therefore indicated to ascertain whether the previously identified challenges remain for victims when accessing healthcare. The aim of this study was to identify and explore with leading third sector support workers, any barriers to accessing healthcare experienced by victims of Human Trafficking. A qualitative research approach was conducted through a focus group discussion. Agency representatives were used as a proxy for the experiences of trafficked individuals accessing care. This method was chosen as professional support workers have a deep understanding of the potential challenges that victims of Human Trafficking experience. Qualitative research exploring Human Trafficking, has been noted to be an invaluable resource, providing a deeper understanding of the true extent of the posed challenges that victims are presented with Hennink, Hutter and Bailey . Trafficking in Cardiff & Vale (C&V) University Health Board. Some agencies had cross national representation with the asylum process and Human Trafficking agenda; others represented smaller local bespoke projects. All agencies represented had experience of the challenges faced by victims of Human Trafficking. Electronic invitation letters, along with a Participant Information Sheet (PIS) were sent to Directors of all third sector agencies, requesting their support workers’ involvement in the research. After receipt of the nominated names of participants by email, this was followed up with a phone call. This provided an opportunity to clarify the study’s aims and objectives. After receiving acknowledgement and nominated names, an email was sent to the recommended potential participants along with the PIS. The only inclusion criteria for recruitment was previous or current experience in supporting victims of Human Trafficking. Ethical approval was obtained from the University of South Wales. An electronic PIS was developed and provided to potential participants by email. To support confidentiality and anonymity, ground rules were discussed, and each participant chose a pseudo name prior to the focus group commencing. Any identifiable information that was disclosed during the focus group, was anonymised on transcribing. The audio recording was destroyed following transcription. One 80-minute focus group of six participants with representation from third sector agencies was conducted in November 2017 in one of the third sector agency offices, at a central city location. The discussion was facilitated by moderators EB and JS. Although, the moderators were flexible in their approach, a topic guide was used to facilitate and guide discussion (Figure 1). Participants included support workers with experience of working with male victims, female victims and as acting advocates for children. Figure 1: Focus group questions. The focus group was audio recorded and professionally transcribed verbatim. The transcript was independently read and re-read by the first author (EB) and then thematically analysed using a coding framework. Themes and sub-themes were identified. The transcription was kept securely on a passwordprotected computer and within a password-protected word document. Only the first and second authors (EB, JS) had access to the transcription. Purposeful sampling was utilised to reflect a cross section of the lead third sector organisations across C&V with a view to recruit between 6-8 participants. The identified sample size and sampling method was deemed by the authors as the most applicable for the purpose of this study, as acknowledged by Robson and McCarten (2016) . Of the 14 participants initially invited, 8 agreed informally via email to take part; representing 9 leading third sector agencies. Of the 8 who expressed interest, 6 were recruited and actively participated; representing 4 leading third sector agencies (Figure 2). Four overarching themes emerged from the analysis, a call for improved access to treatment for mental illness, improved knowledge and training of health professionals, the complexities of navigating two systems (NRM/Asylum Process) and victim’s self-identification (Figure 3). Aisha Access to mental health is honestly very, very difficult. We have people telling us that they’re feeling suicidal and they will discuss thoughts of self-harm. But taking them to the GP (General Practitioner) and getting them to be taken serious as a victim of Human Trafficking is not always straightforward. Getting a mental health referral is also a massive uphill struggle. Jameela It takes a long, long time to get someone to be referred into mental health services and even get them assessed. They just think ‘witchcraft’ or ‘juju magic’ because they’re from that part of the continent. Catrin We’re finding that people are often confused and overwhelmed with their mental health and immediate counselling or talking therapy is not usually available. Sky I think ultimately it comes down to money. The NHS seems to be working at a pace where they will try everything the cheapest methods first. Then the problem either stays the same or gets worse…. Sky I had a client that came to me the other day who had been given medication. I think everyone who claims asylum gets given anti-depressant medication. They don’t get explained what it is, they don’t get offered other resources to health first, they just get handed medication. It’s become the norm. Aisha I think 90% of the people that we support are on antidepressants because that’s a blanket solution. I think it does help if you have someone to advocate or accompany the person to health appointments, as clients sometimes don’t have the confidence to challenge or to say, ‘why do you keep giving me anti-depressants? They’re not helping’. Catrin I agree that’s a short-term solution Aisha, but it shouldn’t even be happening; more awareness and other solutions should be considered. Essentially why is it that we must go and advocate for people not to be on anti-depressants and get holistic mental health care? Sue I went to a recent presentation around mental health and regardless of language, the BME community in general get medication as a first option far more. The figures they gave were amazing. Sky I knew someone who recently had some mental health issues, a British person and they went to the GP and the first point of call, was to give them some website information about how to cope and to advise them of some groups in the local area. That’s not the case with victims of Human Trafficking or asylum seekers, it is straight away anti-depressants. The websites are not available in other languages and groups are only for British people and therefore, let’s give everyone medication. Aisha I had a client who was recently struggling, and I think the GP practice were fantastic, the client received a psychology referral into a PTSD clinic which made a massive difference. I think more action towards therapeutic services could help. Catrin We’re talking on the one hand about mental illness stigma and access to mental health services, but is there further work being done on what individuals feel they need? Jameela I have ended up in A&E so many times as a refuge support worker. One client’s mental illness deteriorated, and she was taken by ambulance to A&E after numerous GP appointments and house calls. The GP’s just thought it was juju magic or that she was scared as she didn’t want to return to her country. If it wasn’t for that visit to A&E, I don’t think she would have got any help. It was only after that, that she was admitted under mental health section for three months. Aisha There is a general lack of understanding with the various health organisations of what victims of Human Trafficking look like and what support there is for them. I have even taken people to the GP and they’ve asked me, what does this mean and how can I help? It’s almost like I have to say this would be a good course of action…. Some specialist health organisations are brilliant, who take the time to understand what it means to be a victim of Human Trafficking and what the additional needs are. Although, I feel there are a lot of people going through health not identified as a victim of Human Trafficking. They are almost being prevented from accessing services that they might be entitled to. Sky There should be more training on how to identify victims of Human Trafficking, because often victims themselves don’t know that they have been trafficked. Sue A positive experience I have witnessed within health is an increased awareness of staff on maternity wards of the existence of Human Trafficking and the looking out for any strange people that don’t fit in with the pattern of everything else and raising it as an action. Sky …. my experience of people going to A&E is that they do not always get offered an interpreter, one lady attended hospital with pain in her leg and obvious mental health issues and they just gave her paracetamol and did not explain to her what it was, she thought it was to help her sleep. Sky There are some services that provide counselling on the principle that the person speaks English, which is often not the case. You also have health and third sector organisations offering different levels of support and they do not always work together very well because everyone is stretched to such capacity. Zulu …my colleague went to register someone recently for dental care on limited income and was told to come with an interpreter. Dental services are already next to none and then victims of trafficking are being asked to bring an interpreter with them. If they are not able to bring interpreters, you are then denying services to vulnerable victims because of a language barrier. Aisha I recently went out to see a lady who has been trafficked and she made several attempts to go to the GP whilst she was pregnant, and the perpetrator kept cancelling the appointments. If it had been followed up and contact made, then this may have ended the exploitive situation earlier for the victim. No questions were asked ‘who are you and why are you cancelling the appointment?’ So, raising awareness around situations like this would be good. Jameela There’s no continuity and maybe doctors just go with what the patient says at the time. Also, if victims are dispersed and are accessing services prior, this can also cause a patient to relapse with their mental illness as restarting care in another area can take a while. It doesn’t seem to be so much of a problem in Wales’, but I have known victims to be dispersed further afield and it takes a while for that service to restart. Catrin On dispersal, how are the health records passed on? The person is having to retell their story time and time again, I guess that is a barrier in itself. Catrin I think that’s generally what seems to be happening, is that the judgement is made on a person’s immigration status rather than their actual healthcare need. Aisha The main issue does seem to be that they’re seen as asylum seekers first and victims of Human Trafficking second. Aisha Dispersal is a huge issue, victims might be in temporary initial accommodation and require an operation or advanced medical treatment. But a GP practice might be reluctant to refer due to no fixed abode and only in temporary accommodation. Sky If they’ve maybe got a problem with their knee or hip, they’re reluctant to refer until they have some sort of settled status. Catrin The challenges are that people are navigating two systems, the asylum system which includes the asylum case and asylum support which is complex. Then the trafficking NRM process parallel to that. Sky There is also no legal aid for someone’s status that is precarious during the initial trafficking claim, only if the NRM is accepted or towards the end of the process. …. Often victims who are claiming asylum as well as the NRM, will be interviewed at the same time and with no advocate. I think nine times out of ten, victims are alone and it is an intimidating situation. Zulu When victims are expected to leave refuge, most of them are left street homeless with no fixed abode and no recourse to public funds. As a result, you find that victims turn to street drugs and alcohol as a coping strategy for unmet mental health needs as they are left with limited or no access to services. Perpetrators tend to then target such vulnerable people and force them into re-exploitative situations. Sky The Home Office feel that it is not their responsibility to provide subsistence if victims are receiving NRM subsistence already. It kind of counteracts the purpose of the NRM support though …. A massive shortfall is that of ‘advice’, clarity on what is going to happen to them and what is involved with the asylum/ NRM process needs to be clearer. I think having that knowledge is important to helping with health. Aisha They will say if they are getting trafficking support then why should they also get National Asylum Support Service (NASS). They are not understanding that this is completely different, and victims are entitled to both elements of support. This is a huge issue. Jameela The other issue is NRM decisions take too long. They say 45 days, but we have got people waiting up to 2 years to receive a conclusive grounds decision. They’re then left in limbo…. Catrin I guess it’s a systematic failure there to protect people. Catrin Yes, I think health should be first responders, because often people will disclose more to health workers and there’s an element of trust already instilled, before going to third sector agencies. Catrin There are issues however with the whole NRM process and particularly looking at the screening notes and the asylum claim; it’s almost like a catch-out of credibility, so I guess health would be dragged into that. Aisha Touching on whether health should be NRM first responders, I think is a good idea in the sense that the health professionals are there for people at their most vulnerable time and likely to get more disclosures. For example, a midwife may be in a pivotal position to receive disclosures around sexual exploitation for a pregnant lady. Although, I also fear that if NRM’s become more statutory then people might not be as forthcoming. Like the taboo with ‘social services’. Sky Currently, there is a massive problem with the way NRM’s are completed and often people are not thinking about the way it can be construed. This has been used before against a service user’s credibility, leaving a victim with a refused NRM decision as well as a refused asylum decision. Aisha The example of the lady that kept cancelling her GP appointments, the first thing that she said to me was, ‘I am not trafficked, if that’s why you’re here’. I said give me two minutes and by the end of it she said, ‘I’ve been wronged and been taken advantage of…’. Her understanding was similar to that of ‘people smuggling’. She just needed to have that awareness of what Human Trafficking constituted for and what the exploitation element was. There is a common misconception that people smuggling and Human trafficking fall under the same umbrella. Catrin They’re not self-identifying, or if they are they don’t really want to talk about it or do anything about it. Zulu Some victims have been working with perpetrators for 30 years. To try and help them re-orientate themselves and believe that they are now free, is an uphill challenge…. Zulu I think the other thing is the connotation of mental illness. Where I come from overseas, you’re talking about someone who should be in a mental institution. So, when health professionals ask about mental illness, victims think you want them to go into an institution. Sue One woman disclosed ‘I don’t have any physical problem’, in her mind having any signs of mental illness was not a reason to need to see the GP. I guess she thought the same way mental illness means institutionalised. Sue Language is a big barrier…. One lady I have been supporting wasn’t going to go in to see the GP unless she had something physically wrong with her. The scope of the support workers role in advocating for victims of Human Trafficking, was described as increasingly varied and ‘no one situation, the same as another’. The challenges and vulnerabilities that victims commonly faced were reported to be diverse in nature with various connotations for health. Disparity and lack of equality of access to services was widely discussed, as were language barriers, identification of victims by health professionals, victim self-identification and the complexities of the asylum/NRM processes. Similar to the findings of the focus group identified that a culture shift was needed to support co-partnership working across the organisational boundaries of health, third sector and the Home Office . A recurrent concern voiced by participants was the existing ill-equipped mental health provision available for victims. In addition, the ‘blanket solution of medication’ with little discussion around the value of combined management such as psychotropic medication and psychological therapy together. It could be argued that this is because participants have had little experience in supporting victims who have received both elements of treatment or whether psychological therapy is as limited as expressed by participants. Preventative measures within mental illness are fundamental in moving away from reactive and crisis care management, as noted with the launch of the National ‘Improving Access to Psychological Therapy’ (IAPT) Programmes . Furthermore, decrease any associated Adverse Childhood Experiences (ACEs) from mismanagement of maternal health needs. Holistic mental healthcare is cost effective, with substantial savings for physical health services and the wider economy [29,30]. Although, considerable variation with IAPT currently remains and whilst working more prudently would lessen financial pressures longterm, initial investment for increasing IAPT programmes is required . Some discussion included BME communities and non- English speaking individuals having less access to psychological therapy compared to other ethnic groups. Individualised care specific to each victim’s needs was recommended, regardless of ethnicity, language spoken or mental illness. This is not dissimilar to previous findings across the UK and already shared initiatives are being implemented to actively engage BME communities with IAPT programmes [32-35]. Promoting awareness of Human Trafficking and the safeguarding agenda were identified as invaluable to safeguarding victims’ health needs, although, current experiences were variable and clinicians were thought to be illequipped to lead on the management of victims. If equity of services is to be ensured and a shift away from immigration status influencing healthcare provision is to be achieved; robust training in identification and management is paramount, with training reaching frontline health and housing staff. This is not dissimilar to what is already supported within the literature as a way of decreasing barriers and promoting service access [36- 38]. The complexities of coordinating the two NRM/Asylum processes were considered as challenging and potentially risky for victims of Human Trafficking. In keeping with the implementation recommendations of the dedicated Human Trafficking Multiagency Risk Assessment Conference (MARAC) (Cardiff Council 2013), clear consistent advice and sharing of information was recognised as being instrumental for victim’s safety and wellbeing [39,40]. The NRM was illustrated as often being mismanaged and further training with statutory first responders was suggested, particularly involving the police and social services. Inappropriate, negative grounds decisions led to numerous challenges for victims. This included the abrupt cessation of subsistence, potential re-exploitation and impact on health access. The concept of health professionals becoming first responders sparked a variation in opinion. Specialist health teams supporting victims on a regular basis were deemed an asset. Although, it was believed involvement of health staff with limited knowledge and experience of asylum processes could lead to more inappropriate negative grounds decisions. Generally, third sector participants wished to remain an integral part of the NRM. Continuity of carer, interpretation services and the sharing of information were all suggested to be empowering of individual’s self-identification, ensuring safeguarding of victims and the promotion social integration. It is considered that promoting self-identification will aid in the capturing of the true scale of exploitation and support the evolvement of new service provision. This is not dissimilar to the DOH (2015) ‘PROTECT report’, a mixed-methods research programme . However, it was questioned whether health professionals can empower victims to self-identify, if limited awareness and misconceptions amongst professionals remain. Whilst all are important components to be considered, this requires a collaborative response effort and shift away from ‘working in silos’. Despite being small scale, the study captured a rich dataset. The authors acknowledge that the findings reflect the experiences of the participants involved and other support workers may have raised different issues. Similar to research, which explored pregnant victims’ experiences and health care needs future research should recruit victims directly . Little research has been undertaken directly with victims accessing generic health care, including dental, primary care and mental health services. Further exploration of the current challenges that health professionals face when supporting victims also warrants investigation, as does whether BME individuals are less likely to be offered or engage with psychotherapy. In addition, the efficacy and cost effectiveness of psychotherapy for victims requires evaluation. 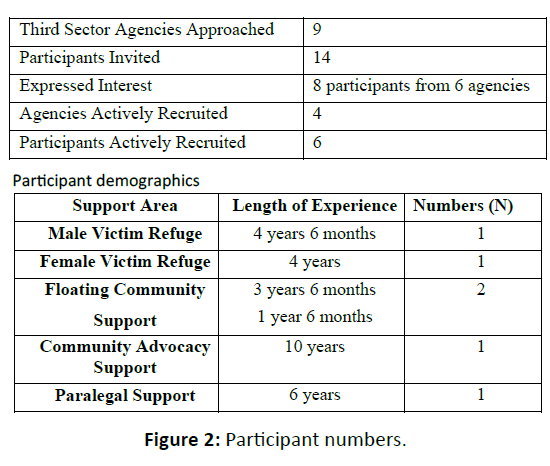 This qualitative study explored third sector agency experiences in supporting victims of Human Trafficking accessing healthcare. A focus group of six participants was held and thematic analysis derived four overarching themes from the data: a call for improved access to treatment for mental illness, improved knowledge and training of all health professionals, joined up working to support the navigation of two processes (NRM/Asylum) and empower individuals to self-identify. The study highlighted the associated vulnerabilities and complexities that victims commonly face when accessing healthcare. Participants emphasised the need for ensuring fair and transparent services for all victims affected regardless of ethnicity, trauma or language spoken. A wide discussion was had around the need for improved access to psychological therapy, but also acknowledged the need for further exploration of the long-term efficacy for victims. In addition, improved educational awareness for health professionals and frontline staff in identifying and managing victims was suggested. However, it was acknowledged that this would require a shift in culture and a move away from judging healthcare need on immigration status. Empowering victims to self-identify was also recognised as a pivotal factor to help in integrating individuals into society. However, for healthcare provisions to improve and evolve as suggested from this research, the Government and NHS need to financially commit to resourcing services to ensure service outcomes are achieved . This was a self-funded study as part of the first author’s (EB) MSc Degree. No financial incentives or gifts were provided to participants or third sector agencies. The first author (EB) is a specialist midwife who provides care to pregnant asylum seekers. Professional working relationships had previously been formed with some of the participants. The author would like to thank all third sector agencies involved with this research and personally thank each participant who gave freely of their time, opinion and experience. Greenbaum J (2016) Identifying victims of human trafficking in the emergency department. Clin Pediatr Emerg Med. 17:241-248. United Nations (2015) Transforming our World: the 2030 agenda for sustainable development. New York: United Nations General Assembly. Gajic-Veljanoski O, Stewart D (2007) Women trafficked into prostitution determinants, human rights and health needs. Transcult. Psychiatry. 44:338-358. United Nations Office on Drugs & Crime (2016) Global report on trafficking persons in 2016. Vienna: Crime Research Section of the United Nations. Stanley N, Oram S, Jakobowitz S, Westwood J, Borschmann R, et al. (2016) The health needs and healthcare experiences of young people trafficked into the UK. Child Abuse & Negl. 59:100-110. United Nations (2000) Protocol to prevent, supress and punish trafficking in persons, especially women and children, supplementing the United Nations convention against transnational organised crime. New York: United Nations General Assembly. United Nations Office on Drugs & Crime (UNODC) (2008) An introduction to human trafficking: vulnerability, impact and action. New York: United Nations. Belon A, Barros M, Marin-Leon L (2012) Mortality among adults: gender and socioeconomic differences in a Brazilian city. BMC. 12:1-10. 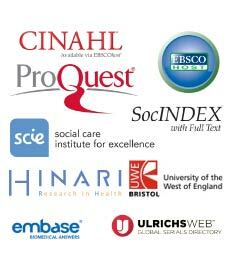 National Institute for Clinical Excellence (NICE) (2014) Improving access to health and social care services for people who do not routinely use them. London: NICE. Department of Health (DOH) (2012) The public health outcomes framework for England, 2013-2016. London: DOH. Oram S, Abas M, Bick D, Boyle A, French R, et al. (2016) Human trafficking and health: a survey of male and female survivors in England. Am J. Public Health. 106:1073-1078. Hemmings S, Jakobowitz S, Abas M, Bick D, Howard L, et al. (2016) Responding to the health needs of survivors of human trafficking: a systematic review. BMC Health Serv. Res. 16:1-9. Altun S, Abas M, Zimmerman C, Howard L, Oram S, et al. (2017) Mental health and human trafficking: responding to survivors needs. Br J Psychiatry. 14:21-23. Westwood J, Howard L, Stanley N, Zimmerman C, Gerada C, et al. (2016) Access to, and experiences of, healthcare services by trafficked people: findings from a mixed-methods study in England. Br J Gen Pract. 66:794-801. Bick D, Howard L, Oram S, Zimmerman C (2017) Maternity care for trafficked women: survivor experiences and clinicianÃ¢ÂÂs perspectives in the United KingdomÃ¢ÂÂs National Health Service. PLoS One 12:1-13. Ross C, Dimitrova S, Howard L, Dewey M, Zimmerman C, et al. (2015) Human trafficking and health: a cross-sectional survey of NHS professionalsÃ¢ÂÂ contact with victims of human trafficking. BMJ. 5:1-7. Viergever R, West H, Borland R & Zimmerman C (2015) Health care providers and human trafficking: what do they know, what do they need to know? Findings from the Middle East, the Caribbean and Central America. Front Public Health. 3:1-9. Hennink M, Hutter I, Bailey A (2011) Qualitative Research Methods. London: SAGE Publications. Robson C, McCarten K (2016) Real world research, fourth edition. West Sussex: John Wiley & Sons Ltd.
Sun J, Chilton M (2017) MotherÃ¢ÂÂs adverse childhood experiences and their young childrenÃ¢ÂÂs development. Am J Prev Med. 53:882-891. Wiles N, Thomas L, Turner N, Garfield K, Kounali D, et al. (2016) Long-term effectiveness and cost-effectiveness of cognitive behavioural therapy as an adjunct to pharmacotherapy for treatment-resistant depression in primary care: follow up of the CoBalT randomised controlled trial. The Lancet. 3:137-144. Black Health Agency (BHA) (2013) For equality in health and social care, State of health, black and other minority groups. Manchester: BHA. MIND (2009) A civilised society, mental health provision for refugees and asylum seekers in England and Wales. London: MIND. MIND (2013) We still need to talk, a report on access to talking therapies. London: MIND. British Psychological Society (2018) Guidelines for psychologists working with refugees and asylum seekers in the UK: A summary. Leicester: The British Psychological Society.